The euro area economy is on track to grow at its fastest pace in a decade this year, with the average real GDP growth forecast at 2.2%. This is the main assessment emerging from the EU Commission economic forecast published on 9th of November. 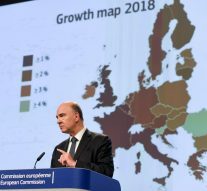 “These are the highest growth rates in ten years”, said Commissioner for Economic Affairs Pierre Moscovici during the presentation of the autumn economic forecast. During the presentation of the new data delivered by the EU, Moscovici talked about an economic growth that “exceeded expectation this year”. He said that almost 8 million jobs have been created over the past three years and there are now 235 people in work in the EU, “more than ever before” and “unemployment should continue to fall”. “Economic growth and job creation are robust, investment is picking up and government deficit and debt are gradually decreasing,” European Commission Vice President Valdis Dombrovskis said, on the occasion of the Autumn forecast. But despite the generally improved situation in Europe, important challenges remain, among them the still high level of public debt in the area, the persistent high unemployment level in countries like Spain or Greece, and the low wage growth, which shows that the economic growth is still not felt by many Europeans. Continued economic growth has led to an improvement of labour market situation, but indicators point out the persistence of many bottlenecks. According to the latest EU forecast, employment growth is set to continue at a slightly lower pace. However, due to several structural changes in the labour market in recent years the return of the conditions existing before the crisis is still far away. As showed by the autumn economic forecast, in August 2017 unemployment rate in the euro area reached its lowest level since 2009. But despite a decline unemployment in the EU countries is still higher than before the economic crisis. And many different remains between the EU countries: in Czech Republic unemployment rate is at 3 per cent; while in Greece it is at 21,8 per cent. And even as regard employment rate there is a wide range among the 50,6 per cent in Croatia and 70,1 per cent registered in Germany. Furthermore those data include also underemployment indicators, such as underemployed part-time workers or discouraged workers. And the share of part-time workers seeking for full time employment is still higher than before the economic crisis. So if in the EU, the unemployment rate is projected at 7,8 per cent this year, 7,3 per cent in 2018 and 7,0 per cent in 2019, on the other hand there are still many difference among member countries and in many cases there is no a real robust recovery on labour market conditions for young people. Furthermore job creation is expected to moderate in the next months, as temporary fiscal incentives fade in some countries and skill shortages emerge in others. So if growth has surpassed expectations according to the European Commission, as private consumption hits high and investments are also picking up, wages and social benefits are rising only very slowly and in many countries there are several group of people still suffering difficult employment conditions. Thus it could be highlighted that growth is really coming back, but still there are many challenges to be dealt with in order to reach a stable situation. And is the same EU Commission which noted a series of risks: such as elevated geopolitical tensions, tighter global financial conditions, the extension of protectionist trade policies, Brexit and the rise in the euro. On the other hand, positive forces could also emerge, from diminishing uncertainty and improving sentiment in Europe to stronger global growth. What is at stake in the new EU Strategy on China? What is in the 2016 EU country-specific recommendations?